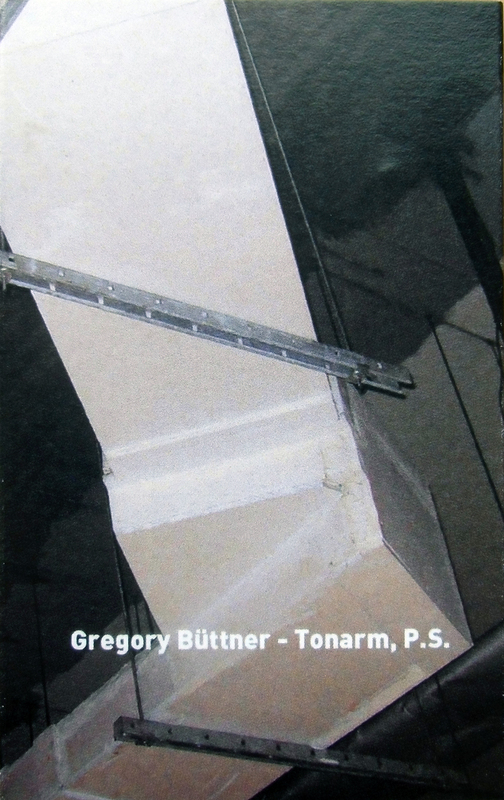 Gregory Büttner (b. 1972) is a Hamburg based sound artist, curator and label owner and has been a key figure in the city's experimental/improvised music scene for more than 10 years. 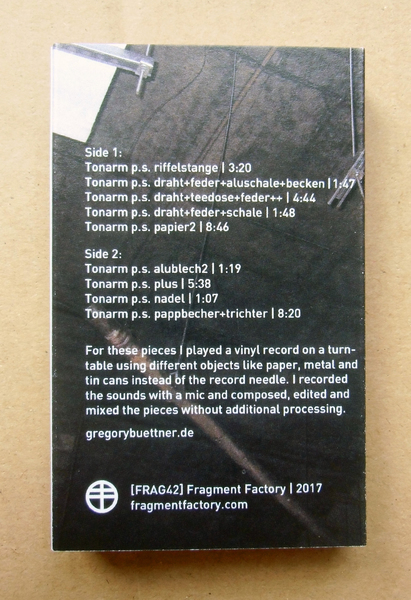 As the person in charge of the 1000füssler imprint and one of the main organisers of the annual „Blurred Edges“ festival for contemporary music, Büttner has collaborated with countless local and international artists over the years, Birgit Ulher, Simon Whetham, Anja Winterhalter, Rhodri Davies, just to name a few. 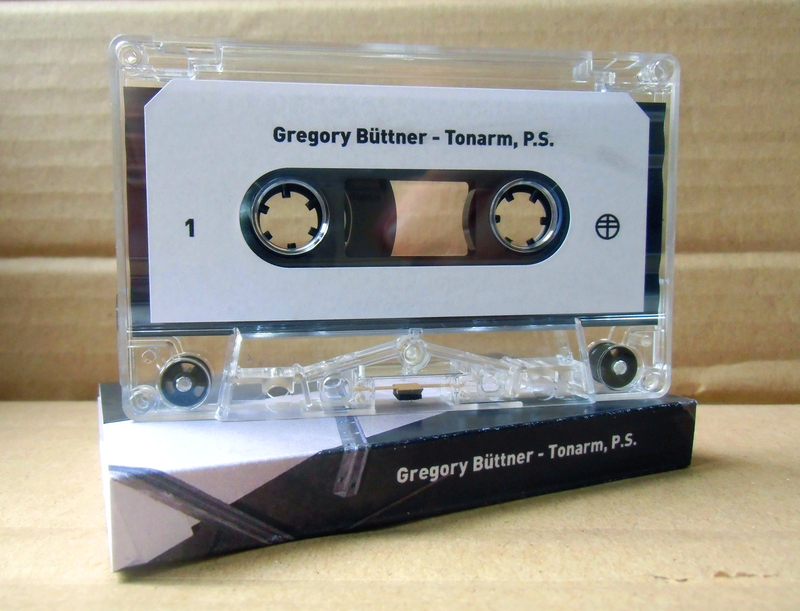 After numerous CD releases since the early 2000's „Tonarm, P.S.“ is Büttner's first work for the cassette medium and perhaps also his most direct approach to the aesthetics of sound. By using different objects and materials to educe noises from record grooves, he draws on the synergy of materiality and acoustics to combine recorded sounds and the immediate sonic response to his actions. By this stripped-down technique, the sound itself seems to materialise and becomes experienceable in a very tangible manner. 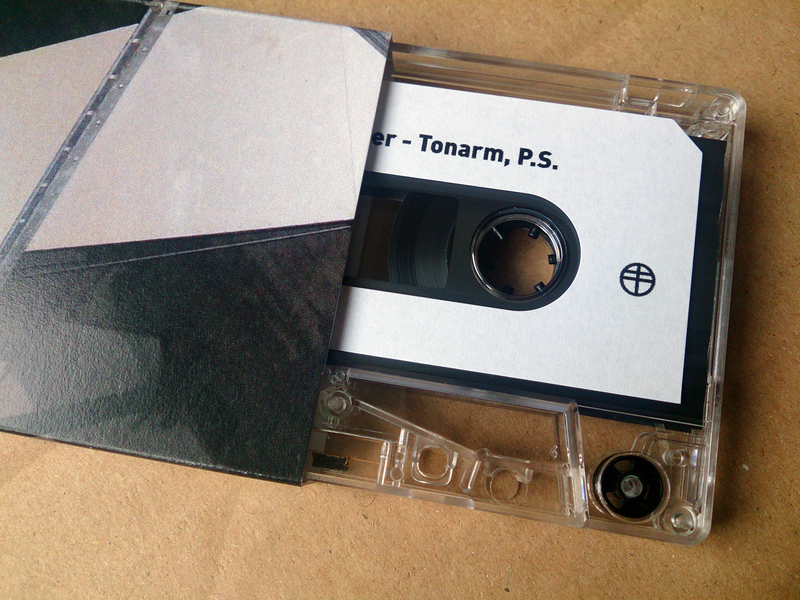 High-grade C45 chrome cassette, edition of 50 copies. In the past I already reviewed some of Gregory Büttner’s music, which operates both in the world of sound art as well as improvisation; the latter with people like Birgit Ulher, Simon Whetham and Rhodri Davies. This is his first cassette release, and for this he built his own tone arm to amplify sounds from a record. We are not told which record. A very long time someone impressed me with very sharp fingernails amplifying a 7” with his fist being the speaker (if I recall well) and it’s certainly something you should try one day, obviously not using your most expensive record or use a needle instead of a fingernail. It gives the music a totally new outlook and that’s what fascinates Büttner as well I guess. The cover lists these objects, albeit in German, and there is a paper cup, tin can, feather, and tea box (and others).